My mom spent all day Sunday building fences around her garden to ward off bunnies. Although cute, they are eating all of her favorites! I recently saw this gutter garden via Katie Elliott's blog thought it could be a great way to plant edibles out of the way of hungry critters. Anyone tried this trick? 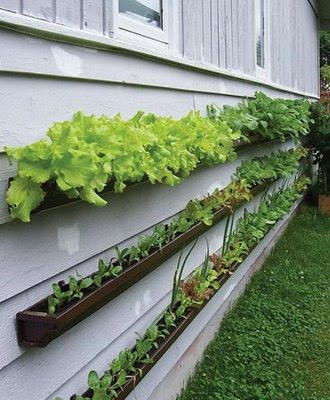 Using a gutter to plant is genius; it could be attached to a fence and altered to fit your space. What do you think? loveeee this idea! And perfect for an herb garden or lettuce like pictured. I think it livens up the exterior wall nicely, too. What a great gardening idea!! !